If your primary need is coin counting, nothing beats the speed and ease of use of the QTech EZ-60 scale. Simply place the coins on the scale and push one button for an immediate count. 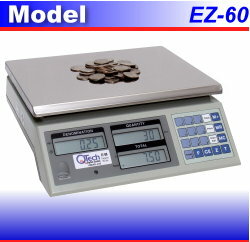 The EZ-60 comes preconfigured for pennies, nickels, dimes, quarters, fifty-cent pieces, and dollar coins. Three customizable keys are available for user-defined coin or token denominations - perfect for arcades. The internal resolution of 1 part in 600,000 offers dead-on accuracy, while the generous 60 pound capacity can handle $1,000.00 in quarters at one time! The 200 hour battery operation makes this scale perfect for route applications. Add our sturdy, but lightweight hard shell plastic carrying case, and you have a cost-effective, mobile coin counting solution. Fast, One-Buttonoperation - just dump and count! 3 Custom Preset Keys allow for user-defined coin or token denominations for quick and easy recall. Eliminates errors and increases productivity! Three large, high contrast LCD windows display the Denomination, Quantity, and Total Amount. Large 60 pound capacity allows for counting a $1,000. bagof quarters. Optional hard shell plastic carrying case protects the scale when used on the road.